All of Frank Lloyd Wright's designs show a keen awareness of natural light and how to maximize the enjoyment and functionality of this natural resource. Wright was also fascinated with electric light and how this light could be in harmony with the interior spaces and its inhabitants. For Midway Gardens, designed in 1913, Frank Lloyd Wright designed an alternating pole lamp concept that he continued to tweak until he created his masterpiece in wood--the Taliesin Lamp. Wright thought among the most beautiful light he saw was sunlight filtering through leaves and branches. A rarer and in some ways even more beautiful light was moonlight filtered through leaves and branches. In the Taliesin lamp, he captured that natural beauty. 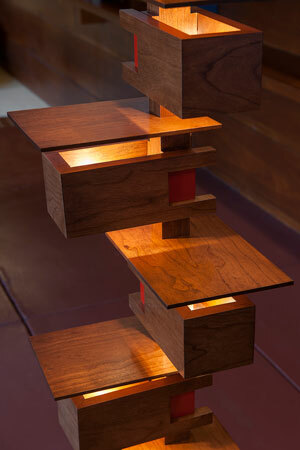 Wright was so fond of this lamp that he had five of them at Taliesin -- one was always near. As he said, "Light reflected, light refracted -- light for its own sake. More and more, light began to become the beautifier of the home and the blessing of the occupants." That is the ideal he beautifully achieved in this work of art. 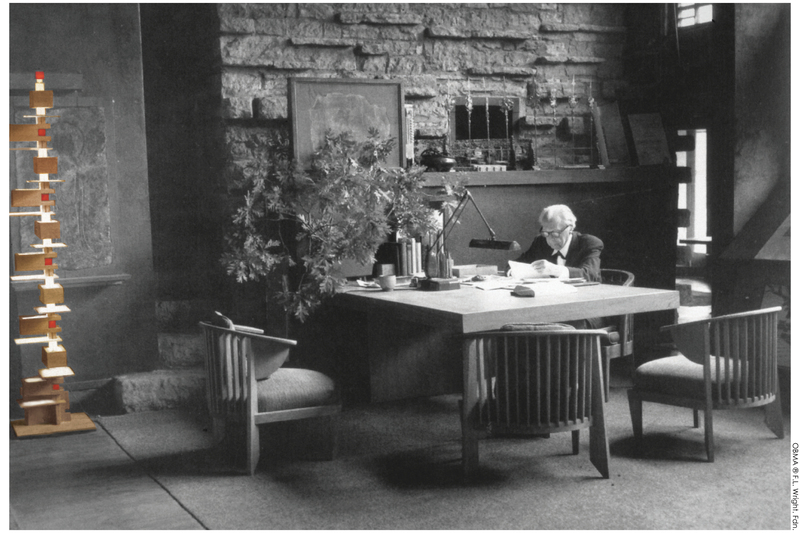 Diane Maddex wrote in 50 Favorite Furnishings by Frank Lloyd Wright, "Always perfecting designs that he especially liked, Wright again returned to his past in 1932 for another lamp. 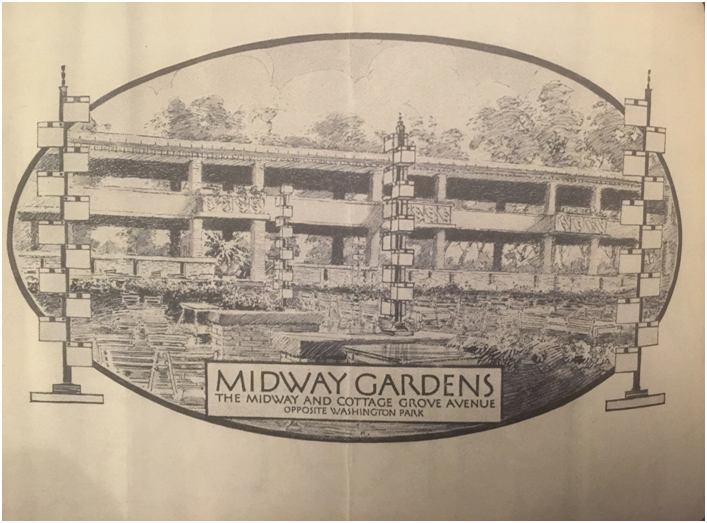 In 1914 he had developed a standing light fixture for the Summer Garden terrace of Midway Gardens, his European-style entertainment center in Chicago. Placed alongside tall, geometric spires by Alfonso lannelli, Wright’s lamps stepped eleven cubes of light upward on either side of a pole—staggered lights that made a stairway to the stars. This lamp also had great appeal to Wright clients, for whom he created various versions that stood on the floor or a table or were built into the wall. In these, the light boxes were turned to 90- or 180-degree angels and the reflecting shades were above or below, depending on the light needed. Unlighted, the lamp is pure Wrightian sculpture. Lighted, it bathes a house in the mysteriousness that Wright worked so diligently to produce." Maddex, Diane. 50 Favorite Furnishings by Frank Lloyd Wright. New York: Smithmark, 1999.